It’s my husband’s birthday! I’m busy today cooking up a storm for him — all sorts of goodies! So I thought I would share three recipes, starting today, for a wonderful meal we had just last week that I think you, Dear Reader, should definitely put on your to-do list. Tune in Wednesday and Friday to hear all about these great recipes. “Do you know what this is?” asked my husband, pointing to a fluffy, little set of greens in our favorite Latin market. It turns out that verdolaga is commonly known as purslane, and like many yummy greens, is considered a weed. It’s eaten all over the world, from what I’ve read. Like okra, it’s mucilaginous, so it’s excellent for thickening up stews. It has a flavor like spinach and sorrel and cauliflower and I don’t even know what else. It’s interesting, that’s for sure. During my research, I came across some interesting recipes but the one that was most appealing was one that made it into a taco filling. While I was reading, my husband was looking for ways to try out our new supply of annatto seeds and powder. He chanced across a great recipe for achiote frijoles recado on FatFreeVegan that sounded like it would go well. Which, with some guacamole, meant we had a full taco-licious meal! But I’m getting ahead of myself. On Wednesday, I’ll tell you all about the beans and on Friday, about the guacamole. You definitely want to try these, so leave a spot on your menu for next week, okay? 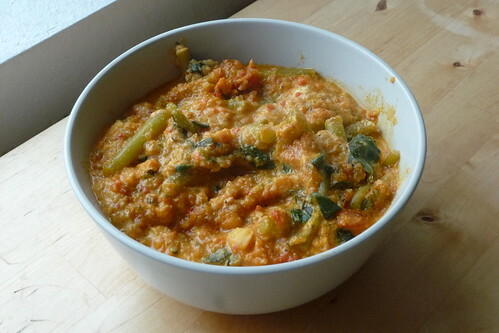 In a food processor or blender, puree tomatoes, onion, jalapeno, cumin, oregano and garlic to a coarse paste. Chop the verdolaga into 1″ – 2″ chunks and place in a sieve set in the sink. Boil some water in a kettle and pour slowly over the verdolaga1. In a nonstick skillet over moderate-low heat, combine oil and annatto seeds. Cook slowly until the oil is strongly colored and the seeds are toasty brown. Discard the seeds and turn up the heat to medium. Pour the paste into the skillet, add the verdolaga and cook until thick. Stir in the cheese and continue to cook, stirring occasionally, until it’s thick and bubbly. Yes, this is basically the fast way to blanch a small amount of vegetables. If I had had a burner and a pot free, I would have boiled some water and dunked them for 10 – 15 seconds. I didn’t, so I used the electric kettle. This entry was posted in gluten-free, mexican, recipes, sauce, side, untranslated, vegetable, vegetarian. Bookmark the permalink.